gHacks has a diverse range of editors, living in, among other places, the UK, Germany and Hungary. All write in the medium of English, but learning a foreign language is no easy task. I am currently trying to learn French and German and often find myself using many computer-based resources to ease my learning, some obvious, like dictionaries, and some not-so, like podcasts. Different languages generally have different online dictionaries. For German, I often find myself using dict.cc, whilst for French, I use Reverso. The best way to find dictionaries is to Google, but one option to definitely consider is the ever-growing Wiktionary. Effectively every language has a Wiktionary and whilst it can be difficult to navigate, it is quite large and the range of languages makes it amazing. Verbix is another web-based tool. It allows you to conjugate verbs, and even supports irregular ones. The free web-based tool supports verb conjugation in 97 languages, ranging from Afrikaans, to Milanese, to Old English to Welsh! They offer Windows shareware which supports over 300 languages. 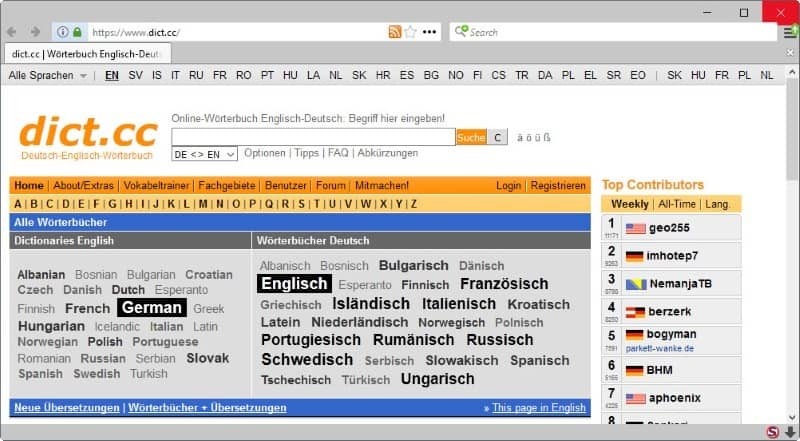 Verbix also offers a tool too which analyses text and guesses its language. Podcasts are a very useful way to perfect your listening. It is very useful for me to hear a native German or a Francophone to speak. Browsing iTunes will obviously bring up many possibilities. My suggestions? For German, use Slow German. For French, try One thing in a French day. Naturally, I can't make suggestions for other languages! One of the best ways to learn is purely to repeat. Many vocabulary trainers are available. These allow you to input words, or use preprepared word lists, and then be tested on them. The trainers compile statistics so you can identify weak points etc. For OS X, try the freeware Vocab. A wide-range of options exist for Windows users; ProvaLingua seems popular. Another option, which also works under Linux, is this program. I already mentioned that Wiktionary exists in many languages, but so does Wikipedia. To improve your knowledge of a foreign language, try reading an article on your native language Wikipedia and then on a foreign one. It won't be the same word for word, but many ideas will be similar so you should be able to pick out some key words. Wikipedia is also a good way to find technical vocabulary in a foreign tongue. Ghacks editor Joe looks at essential language learning tools, and mentions dictionaries, verb conjugators, podcasts, vocabulary trainers and Wikipedia. I think that you forgot one of the most interesting: Google Images! As Pete Lidwell says in the Google Blog (http://googleblog.blogspot.com/2009/03/spargel.html) you only have to search the term that you don’t completly understand and a graphic representation of the word came up instantly. I think it’s great specially for ideas and words that have no specific translation. Great collection of tools though, I need to brush up on my German, and I’ve wanted to learn Japanese for so long! The topic itself is interesting, but I’m afraid that it is to big to be covered in one post. – online language courses, that were already mentioned on GHacks. – there are also some dictionary soft (online is good, but offline can react faster). For Russian-English I can mention Jalingo, Dicto. – there are also browser extensions (for Firefox) – QTL, very good dictionary addon (many languages, some dictionary sites and access to Wiki data too), Pronounce – pronounces selected word using Merriam-Webster (AFAIR I met both on GHacks). – there are also many specific soft (English Trainer, etc). Its very interesting topic about learning language through tools.There are many tools that help to learn language but 5 essential learning tools are described above.Different languages generally have different online dictionaries.There was a time when things were different. There was a time when I had to learn a language for a living and had a different attitude. it is very helpful topic.